Google Cardboard is pretty awesome. Snap in most Android and iOS smartphones, strap it on your head, and you’re suddenly whisked away into another land. Maybe you’re in a game, maybe you’ve dropped into a 360-degree landscape, or somewhere else. And, the coolest thing about Cardboard, is that it’s usually really cheap. Or, in the case of Verizon customers today, it’s free. 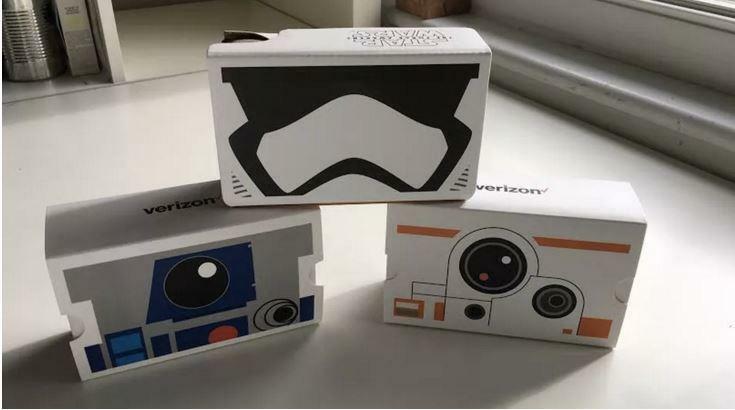 That’s right – Verizon is offering Cardboard VR for free to its customers today and, better yet, the units are outfitted with Star Wars themes. According to Polygon, you’ll find BB-8, Kylo Ren, Storm Trooper and R2-D2 designs. Verizon warns that they’re only available while supplies last, and only from “select” retailers, but you should be able to find one in stock. A quick search in my zipcode showed dozens of stores within driving distance with Cardboard VR available. So far as we know, everything else about these units is the same as the standard Cardboard that you can get from Google or elsewhere. Love the paint job, though.